Everybody loves ice cream! And everybody knows the value of following a great tradition. Passionate family commitment and a delicious recipe have paired to make MacKay’s ice cream a great tradition for nearly 75 years. Deep-rooted in its geography, MacKay’s ice cream is made in Cochrane with 100% Western Canadian high butterfat cream. The bright and hopeful entrepreneurial couple of James and Christina MacKay took over the ownership and operation of the General Store in Cochrane, Alberta. To expand their growing business by attracting Calgary day-trippers as well as catering to the tastes of a local hot summer crowd, the MacKays started making ICE CREAM in the back of their shoppe. So officially begins the ICE CREAM legend. 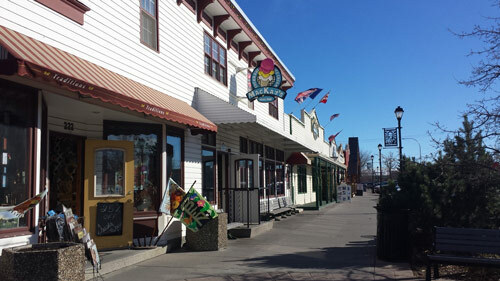 With a change in Alberta law, the ICE CREAM shoppe could now open wares on Sundays. This was a perfect match for the many Calgary families wanting to spend a delicious afternoon together. It is now a long standing tradition. As Jimmy and his daughters, Rhona & Robyn, refined their operations, they watched demand for their amazing concoctions soar. In the end all grocery related items were removed from the store so the focus could be ice cream. The Sunday crowd reached record levels and servers slumped to their chairs after scooping up over 4500 ICE CREAMS in a single day! Scoop by scoop, it became clear that production capacity needed to be increased and the back of the little general store was no longer enough space. The same great methods and ingredients moved across the tracks to the current manufacturing plant in Cochrane’s industrial area. With James’ sudden death and Christina looking toward retirement, Rhona and Robyn took over the thriving family business. Rhona and Robyn attend Penn State and Guelph University ICE CREAM Short Courses (yes, there is such a thing!) in their quest for excellence and professional development. MacKay’s goes tropical! Imagine how exotic Mango, Young Coconut, Durian and Green Tea would have sounded to the regular clientele! Robyn and Rhona had known for years the rewards of making people smile and relax by dishing out a perfect ICE CREAM treat. They were officially recognized for their efforts by being named Canadian Female Entrepreneurs of the Year and by being selected for Maclean’s Honour Roll. As if the amazing list of flavours wasn’t paralyzing enough, Mochaccino, Cookie Dough and Cotton Candy flavours were added. They immediately became huge hits. The original shoppe front is lovingly restored in an effort to celebrate the heritage of both the shoppe and the town where MacKay’s began. 2011 marks the beginning of the third generation of the MacKay’s family business, with granddaughter Meghan and her husband Mark continuing the tradition. 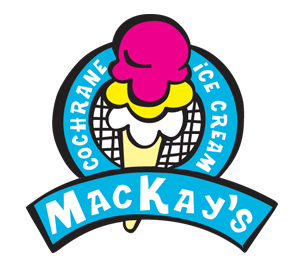 2011 also marks the 65th anniversary of MacKay’s ICE CREAM! 2015 Meghan and Mark continue the tradition of adding new and exciting flavours to the menu, with Kulfi, Haskap Berry, and Keso.